Photos courtesy of Orchard Recovery. It’s hard to believe that a whole year has gone by since our last Recovery Day here in Vancouver. Some of you may remember my VO blog post about it at that time. What a great day it was. There was excitement in the air as those in recovery, as well as many of their loved ones, laughed and sang and danced together on the lawn of the Art Gallery in Downtown Vancouver. Children enjoyed the face painting and balloons that were freely given. Many addiction resources such as treatment centers, detoxes, and recovery homes manned their tables full of information for those who were looking for assistance with their own addiction or for someone they love. There was also an opportunity for loved ones to talk to therapists like myself, who specialize in working with those who are in significant relationships with people who have addictions. And when the tally of clean & sober time of everyone in attendance was complete, there were approximately 1500+ years of recovery represented – how awesome is that? 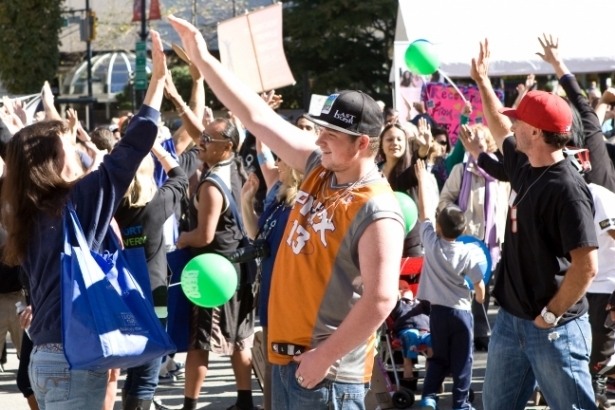 This year, the 2nd Annual Rally for Recovery will take place on Recovery Day in Vancouver, as well as in 10 other cities in Canada and many in the US, simultaneously. Ours is happening on September 8th in the same location as last year: the front lawn of the Art Gallery downtown from noon-3 pm. Last year’s turnout was fantastic – and we’re hoping that this year there will be even more people coming out to the Recovery Day event. Once again there will be info tables, talks, testimonials, singing – and lots of laughter. We will be tallying all the recovery time again this year – so come on out and know that your sobriety time counts. Let’s all be part of this magical, miraculous celebration! If you are an addict (of any kind) in recovery, the loved one of an addict (whether in recovery or not), or someone who is still struggling with addiction and would like some information about the help that is available to you – please join us – Everyone Is Welcome! For more information, please go to http://www.recoveryday.ca, and to read more about the history of Recovery Day and how it got started, click here: http://www.recoveryday.ca/#!what-is-recovery-day-/aboutPage.